The Shell EMI initiative in offshore engineering aims to strengthen UWA and Western Australia's position as a global offshore engineering hub, through world-class research and education. The research spans offshore engineering, from geotechnics to metocean, building on the platform of UWA's world-leading Centre for Offshore Foundation Systems. A key aim is to realise Australia's first mover advantage in the expertise of efficient FLNG operations. New procedures for pipeline stability design are being pioneered by the Shell EMI researchers, through UWA's O-Tube program and the STABLEpipe JIP. The research uses a new paradigm with the stability of the seabed as the foremost element. A new guideline has been approved by DNV and is unlocking designs with more efficient stabilisation strategies. This project has won numerous industry awards. Shell is supporting the RIGSS JIP, which is being led by Shell EMI researchers that is developing to develop new geotechnical survey technologies which will provide improved predictions of seabed properties. The Shell EMI researchers have developed new methods for assessing pipe-line seabed interaction. The research has seen rapid adoption in the 2014 update of the SAFEBUCK Guideline which will soon merge with the DNV RP-F110 design code. The new methods are being applied by Shell and other operators, leading to improved assessments of lateral buckling and axial walking, often with cost savings through reduced mitigation works. Physical and numerical modelling of multi-body hydrodynamics is being used to optimise predictions of FLNG operations. Outcomes from research by the Shell EMI team are being applied to Shell projects. 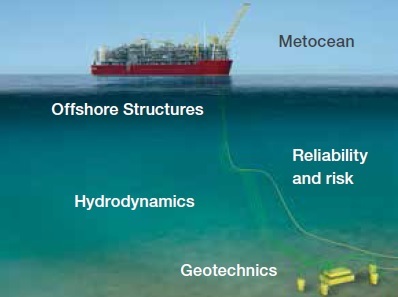 Shell-UWA collaborative research is also exploring improved predictions of the metocean environment offshore Australia as well as new solutions for anchoring FLNG units. UWA's offshore engineering research is underpinned by world-leading facilities for modelling offshore systems, including Australia's National Geotechnical Centrifuge Facility, and three O-Tube cyclone simulation flumes - which are uniquely capable of reproducing extreme metocean conditions at the seabed, for example to study pipeline stability. UWA also has leading technologies fo numerical modelling of geotechnical and hydrodynamic systems.